2018 marked the eleventh year of our collaboration with the Siebold Huis museum, in Leiden, in organising the martial arts demonstrations during the yearly edition of the “Japanmarkt”. The demos are held in the hall of the museum van Oudheden and over the years we have seen it grow in popularity. Young and old crowd the central hall in front of the ancient temple to follow each group, satisfy their curiosity and find out more about budo. Gasps, laughter and sounds of appreciation come from the audience. For everyone involved it entails a few hours of preparation, concentration, discipline and of course a lot of fun. 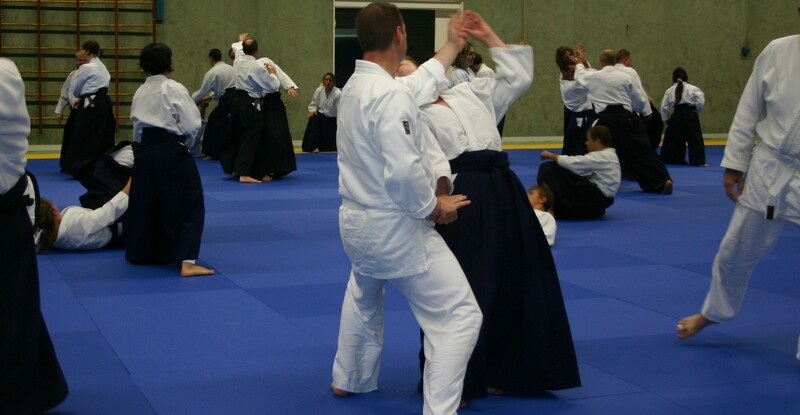 During the demo, Aikido School Leiden aims at showing how aikido is an inclusive sport, for all ages and levels and how it can benefit each individual on their personal path. The martial arts demos is not a competition and it is not a moment for one club to shine over another rather to show elements such as values, structure and discipline that are a common denominator in many of these sports. It is about Budo. Looking at the increased popularity it is clear that the martial arts demos have become a very important fixture at the Japanmarkt in Leiden. Its popularity and the audience grow by the year; it will be a nice challenge to find accommodations to fit even a bigger crowd in the demonstration edition 2019.